Revolutionize your lead generation, connect with more customers and grow your business. Do you want to attract more leads, present more effective offers and achieve higher conversions? Is your business struggling to generate sufficient leads to increase sales? Do you need to top up your sales in 2019? Do you want to have a prosperous New Year with more leads, more sales and more profit? 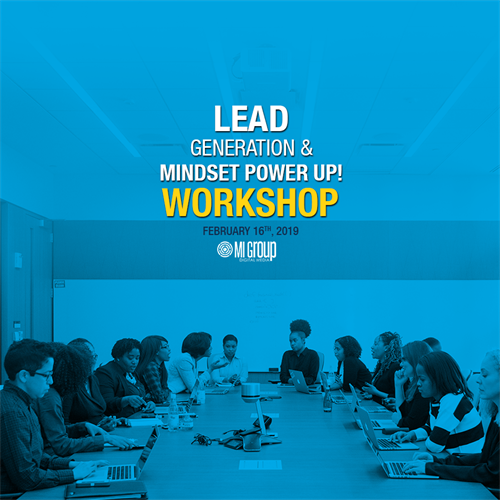 Our Lead Generation and Mindset Power Up Workshop is a MUST to attend. If you are often puzzled or confused about how to maximize online technology tools to grow your business, this workshop is for you. Most small businesses don’t understand how to capitalize on the power of online technology tools and don’t have the right mindset to get it done. How can you know you're generating the hot leads your business need? Is it time to review your lead generation strategies? Does generating leads make you pull your hair out? Are you struggling with the use of online technology tools to grow your business? How much is it costing you when no leads are coming in? How many potential customers are not seeing your value? Can potential customers understand your offer? Save your seat today.. it's free to attend and we are only accepting a limited number of businesses.